For comfortable temperature documentation without any alteration of the refrigerator or freezer. The use of the pen-recording thermometer is recommended whenever the temperature inside a refrigerator or freezer has to be recorded without it being necessary to be able to read the measurements from outside the appliance. The thermometer can be placed in any desired part of the refrigerator or freezer, with no installation work necessary. 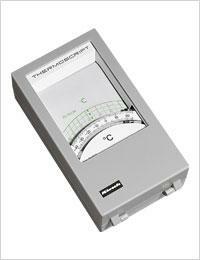 The pen-recording thermometer has a clockwork drive mechanism, making it independent of the mains power supply. The temperature scale is clear and legible, and is located behind a window together with the recording strip. Its solid housing acts as a thermal trap and ensures that the thermometer always displays and records the temperature of the contents, and does not react to short-term air-temperature fluctuations, for instance when the door is opened briefly. - Measuring range: -40°C to +25°C. - Maximum length of recording period per strip: 32 days. - Length 16.5 cm, width 9.2 cm, depth 4.6 cm. Weight approx. 1 kg. - Spare waxed paper strips are supplied in packs of 10.